Proof that some people find Lent Madness to be amusing. It has come to the attention of the Supreme Executive Committee that not everyone is enthralled with our display of saintly kitsch. In fact a small percentage of commenters have cast aspersions on the Round of the Elate Eight. We have decided to share and, yes, rebut a few of these less-than-flattering comments. Well, as much as we strive to maintain your comfort and give you a good time, it’s not a Barbie. It’s a Mary Magdalene Wisdom Doll. We don’t mind if you criticize us using the wrong doll name, but we don’t think you want to get on Ken’s bad side. Casual irreverence? Please. Our irreverence is unparalleled in the history of Lent. Or the history of madness. Don’t sell us short. Actually, according to the liturgical calendar that has existed for centuries, Holy Week is next week. Also, you may be surprised to learn that we Christians have a specific day for pondering the Crucifixion: Good Friday. We’ll be done with our “mockery & irreverence” theme by then. Why is humor in quotes?! That’s offensive. Also, we are puzzled. If the first match-up of the Elate Eight had been two male saints, we’d be accused of sexism. Here we are in the midst of the Year of the Woman in Lent Madness 2012, and we can’t seem to win. Stay tuned, and you’ll see that we are equal opportunity kitsch-finders. Just look at today’s battle between Jerome and Bonhoeffer. If you don’t believe us, have a look at the archives of Lent Madness 2010 and Lent Madness 2011. In the end, if you’re not into the kitsch thing or find it offensive, do yourself a favor and go on a Lent Madness fast. We’ll see you for the first two rounds in 2013. Those of you who hate Lent Madness at this point might want to visit “Literally Unbelievable.” You’ll find like-minded friends for your crusade toward an anti-humor, anti-satire, anti-fun internet. Meanwhile, we’ll carry on here. St. Paul said we should be fools for Christ. Jesus partied at Cana. We think a little foolish fun for the sake of the Gospel is just fine. Even in Lent. 94 Comments to "Kitsch Cranks"
And I support this comment. Well! Personally, I like be able to add to my kitsch collection and its nice to have someone else locate it for me. And Erasmus wrote In Praise of Folly. “EVEN” in Lent? I say ESPECIALLY in Lent. I, too, support this post. What’s wrong with having a little fun … unless its Good Friday? Excellent posts today with your responses. I have learned more about saints than I ever knew and love the kitsch. Perhaps those who have been so offended or disappointed should give up Lent Madness for Lent??? I’m with you guys. And I thought as long as you didn’t use the ‘A’/’H’ word you were ok having a sense of humor in Lent. Good Friday excepted of course (but is Good Friday really part of Lent? Hmmm…. have to count). To the best of my knowledge the Paschal Triduum is the period of three days that begins with the Mass of the Lord’s Supper on the evening of Maundy Thursday and ends with evening prayer on Easter Sunday. So from a liturgical standpoint, not Lent. From a giving up chocolate standpoint, it is still Lent until Easter Vigil when you hear the first “alleluia”, which is (in addition to the presence of the really cool dangerous mix of fire + liturgical vestments, and also in addition to the highlight of my religious year — hearing the singing of the exsultet) why everyone really should attend Easter Vigil service. I actually enjoy the kitsch, particularly after watching your video. Nunzilla? Really? Besides I am a huge fan of the “Friends of Episcopal Priest Barbie” Facebook page. Check it out if you haven’t already. Wow, if these folks are upset at Lent Madness irreverence, they need to visit the Ship of Fools website. Party on, Dudes and Dudettes! Some people need to get a life! Ok, now back into silence. Really, I am eager for Lent to be over; I am dying for a hamburger. Is there a Saint for that? LM has been quite a learning experience, first about some saints I’d never even heard of, as well as more about familiar ones. And I would bet that those unhappy persons didn’t like the sweatshirts from several years ago which proclaimed that the wearer was ‘one of those crazy Episcopalians’. Good thing this is the one year that I DID NOT give up Christian kitsch for Lent. Is that supposed to be a picture of a laughing Jesus? Surely, you know that no verse in the Bible says that Jesus ever laughed or even smiled. There are some folks who say that this lack of Biblical authority is conclusive proof that Jesus never laughed or smiled. And his mission was obviously much too serious for that sort of thing. So you’re moving from being charged with mere irreverent sacrilege to being charged with gross Christological heresy! Focus on the family says Jesus laughed, and that’s good enough for me. Also, see Ecclesiastes 3:4 and John 11:35. Seems like rock solid evidence that Jesus laughed. Scott see my post from here in virginia..
Just because there are no versus describing Jesus laughing or smiling does not mean he did not do either. There are no versus describing him relieving himself either, but the Gospels all point out that he was human and that he did eat and drink things. I doubt that Jesus was a very stern faced guy all the time. He turned water into wine and called the little children to him. And he condones laughter in the beatitudes (Luke 6:21). I take Hebrews 4:15 (“For we do not have a high priest who is unable to sympathize with our weaknesses, but we have one who in every respect has been tested as we are, yet without sin.”) and the teaching of the Council of Chalcedon (“like us in all respects, apart from sin”) very seriously. Including your example. I’m absolutely positive that Jesus laughed and smiled. I suggest watching Jame Martin, Laughing with the Saints… it is on You Tube in 3 Parts. He explains why the gospels, based on their intended audiences, would de-emphasize Jesus’s joy and laughter. Thank you! Thank you! I support this post. Good for you SEC! My Buddy Christ gives this post a “thumbs up”! Ah, the Buddy Christ! To go along with your blessed golf clubs! Of course He does. Doesn’t it just “pop”? I have been in an Episcopal church in Chanute, Kansas that actually has a picture of laughing Jesus on the wall, so yes it is true that Jesus laughed. Well at least maybe true in Chanute, Kansas. As for some who did not like the kitsch they should be thankful that you did not have a round featuring great “kitschy”, is that really a word, songs. I’m not talking here the obvious like “When The Saints Come Marching In”. I am talking about the heavy hitters like “Dropkick Me Jesus Through The Goalposts of Life” or “I Don’t Care if it Rains or Freezes Long As I’ve Got My Plastic Jesus Sittin on the Dashboard of My Car”. In terms of kitsch your efforts thusfar are well, almost in good taste. Looking forward to more tomorrow. Please! “Oh When the Saints Go Marching In” is NOT kitsch! It’s practically a hymn. If you live in the right state you can hear it at funerals as often as “Amazing Grace,” which reminds me that I should include it on the MUST PLAY music list for my memorial service! LOVE “dropkick me Jesus” ! We sing Drop Kick Me Jesus on superbowl Sunday – every year. In church. A previous rector even had a sermon for the drop kick. And yes, we are an Episcopal church. If Jesus was fully human, of course he laughed. I think God laughs too. Jim, Jesus of Chanute KS is laughing that you all are Jayhawk fans. Wow! The SEC are not at all shy about rebuking naysayers. Good. No point in being either Dupreme or Executive if you can’t flex your muscles just a bit. Most diverting. I’ll admit to being a little thrown off at first glance; i wasn’t prepared for the kitsch. From an earlier post from a celebrity blogger i thought the rounds would get more factual and intense. Cut me some slack, it’s my first year, and I’m cool with the kitsch. Ir’s better than the mudslinging going on @YouTube. First, I have to say that I have loved every second of Lent Madness. I’m a newbie this year, and it’s fantastic. Especially the kitsch. I love kitsch. Who wouldn’t? But I need to ask you a question so that I don’t have to go through all of the archives to find the answer. My son has little league practice shortly, and we have to do homework. I was trying to explain to my husband the joy that is the kitsch of the Elate Eight. He said, “I’m sorry. I have no idea what you’re talking about.” This happens a lot in our house. I can explain to him the joy of the kitsch. But he’s a recovering Catholic, and he doesn’t understand some of the choices for saints. Could you help me with that please? Like Bonhoeffer, Underhill, etc.? First of all, I loved the kitsch, and I love Lent Madness as a whole, and if some people don’t share our sense of humor, so be it…but, guys, you don’t have to be so defensive. Your rebuttals come off fairly harsh, especially when you single out specific comments (and, thereby, commenters). Have a little humility. All in good fun until someone puts an eye out, as they also say. Let’s all put down our plank tweezers and walk away…back to the brackets! I gotta say….I’ve loved Lent Madness up to this week…and I’m not much on kitsch, so I was privately, silently a bit disappointed that there wasn’t some other criteria for voting. In fact…I haven’t voted this round because it seemed pointless since the matchups didn’t seem close at all, and the kitsch was totally not a draw to a decision. HOWEVER… I have to agree with Meg and Jennifer here that the SEC seems to be the cranks here…and more than a little…heavy handed in their defense of their decision. Hey, you live by the kitsch, you die by the kitsch! Perhaps the SEC has let their exalted positions go to their heads a bit…and need to re-read some of the bios of the saints we’ve been learning so much about, and practice a little humility. But we are EPISCOPALIANS, if we can’t agree to disagree, live and let live….we’ve learned nothing from this otherwise wonderful exercise in fun and learning. Don’t spoil it, boys! Bravo!! And, yes, I am the one who made the negative remark about “Barbie” but it was the (Barbie ‘looking’) MM Wisdom Doll that helped me make my choice yesterday and the fact that I can’t stand Barbie Dolls (sorry, Ken) does NOT mean that I don’t appreciate all the the kitsch–life would be pretty darned boring if we couldn’t laugh once in a while. Now if it had been Evelyn Underhill that was the model for the ‘Wisdom’ Doll–that’s a doll I’d really like to see. Poor Evelyn would be rolling around in her grave over that! I don’t think Evelyn’s shoes would fit on Barbie’s permanently high-heeled feet. One could create a full time ministry securing any kind of religious, (Christian and otherwise) ,kitsch that anyone could possibly desire. I did a sermon one time and I had at least ten things that were directly about Jesus to show the congregation. I purchased them at my local religious emporium. I think the sermon had to do with anything that put Jesus on their radar was a good thing. When you take the key chain off of the hook every day you get a chance to remember Jesus. Worked for them, works for me. Just to see Mary Magdalene every day would remind me how special she was to Jesus. Oh, puleeze! Lent Madness has done more for me than all the giving up chocolate and Bible study I meant to get around to. I appreciate the witty writing and the kitsch makes me laugh. Remember, people, Sarah laughed. God has a sense of humor. C’mon M’ame. . .!!! (At least, you ladies who seemed to think the kitsch was, I think the buzz word this week was, misogynistic!) A Saint that turns inside out into a lion? It seems to me the kitsch has been very even handedly applied. And, until a few days ago, I had never seen “kitsch” defined! See, LM is educational at all kinds of levels. Scott, one thing I did NOT expect to see in LM was an allusion to James Dobson!!! It just shows that LM is like a box of chocolates, right Forest? You (SEC) are AWESOME! One more question: Where can I get one of those “crazy Episcopalians” sweatshirts?! When creating something humorous in nature, it helps to have broad shoulders and the ability to take comments from all sides without responding in a mean-spirited nature (i.e., the Literally Unbelievable quip).Laughter and disagreement in Lent can coexist. Maybe the bigger lesson is that Lenten practices may help all of us better tolerate writing, kitsch and critique that don’t match our own views. Lining up sides or digging in our heels sort of takes the fun out of all of this. If the mark of the early Church was (something like) “Look how they love one another,” then let’s get back to celebrating the saints and stop slinging stuff in both directions. I read this for light hearted and kind fun and a degree of reflection. Please help it stay that way! Enough already. Hey folks, from the start the humor was evident from day one! Give it a rest folks! Next week is the time to be really serious! Nothing wrong with a little kitsch, but I draw the line at Jesus in bad dentures. First, no one, not even the Son of God, has teeth that white. They’re too conspicuous. And even if they started out that white, after thirty years without benefit of water pics and garnet paste, they would not have been. Second, no one, not even the Son of God could have that wide a palatal arch. There’s room in that mouth for twenty teeth top and bottom; the human set has a mere sixteen. Third, they’re too straight. When I worked as a chairside assistant in a dental office, we tried to convince people that picket fence teeth do not look natural. They look like, well, cheap dentures. The Pre-Raphaelites were bad, but this is plumb awful. Fr. Tim, please say hello to Emily Hutchinson for me. Maybe this is after the Transfiguration, when everything became dazzling white!? LOLIN -That’s “Laughing out loud in Lent” for those of who haven’t figured out internet shorthand. Well, Tim, I do think you redeemed youself. Actually, it’s healthy to have ll the discussion especially about such famous people. But a big thanks goes to you and the SEC for posting the picture of the laughing Jesus. It’s always been a favorite.. In fact, I have one in the bedroom, and another in our guest bathroom. He’s laughing as we turn off the lights..It’s my guess he’s also getting a big laugh from watching all of us and our Lent Madness! One of my first thoughts was, to paraphrase a smidgen, “…this kitsch could have been sold for more than three hundred denarii, and the money given to the poor.” I’m not fond of kitsch (unless it’s somebody else’s kitsch in which case etiquette requires polite admiration) but I am a long-time believer in and supporter of that which I call “Holy Nonsense.” Lent Madness is an outstanding example of this. Tim and Scott, you guys rock! When you expand the LM Store, perhaps you could add some kitschy Tim and Scott action figures. As long as I get to design the Tim Bobble-head doll, I think you have made an excellent suggestion. Ooooh, Evelyn that’s a great idea – kitschy Tim and Scott action figures. Sorta like Nancy Pearl, only clergy rather than librarian. I think the Tim & Scott Bobble-heads would be kitschier. If you can’t handle the kitsch get out of the kitschen, right? Yes, in the insane week before Holy Week, which is full of madness for most clergy and lay employees, I’ve sunk to the level of bad puns. In the scramble to put together all the support materials so that others might enjoy a Sacred and Spiritual Holy Week, I appreciate a heavy dose of silliness. Keep it up. And I don’t know if Jesus laughed, giggled, chortled or snickered, but David did cartwheel in the streets for joy, right? …and David was mostly naked when he did it. Depends on what an ephod is, and whether or not a cartwheel would …um…displace it. He must have put on a pretty good show though ’cause his wife told him in no uncertain terms to smarten up, go put some clothes on, and stop shakin’ it for the ladies (2 Sam 6, less paraphrased than you might think). Jennifer’s “less paraphrased than you might think” just sent me over the edge! This whole thing has been TOO much fun. Thanks, Scott and Tim, et al, for the time it takes to do this…though the mind reels at what fantastic sermons aren’t getting written for all our edification’s sake…and I hope everyone can just enjoy the rest of what will soon be a lovely memory. And come on…God has to have a sense of humour…just look around on a Sunday morning! But guys…don’t let naysayers distract you so much from the success! The fact that we’re learning is a mere happenstance…it’s supposed to be FUN! …making an ephod, then, basically A Thong of David…? This post was the final nail in the coffin: I am now conclusively in love with the Supreme Executive Committee and feel strongly that its oversight as a governing body should be extended to encompass a greater sphere than it does at present. Are these critics REALLY serious? Come on. Weren’t we playing this for fun??????????? And, a funny thing happened: I also LEARNED a whole lot about these stalwarts of the faith. What organized religion sometimes lack are JOY and LAUGHTER. Some of these folks might try both. They might get a few more converts and followers to the faith. I appreciate your focus on all the saintly kitsch. It reminds me, to be careful to 1) not take the notion of sainthood too seriously – they were, after all, simply “elaborations of a tube” (to borrow a phrase from (St.) Leonard Cohen) just as I am, but beloved of God, just as I am; 2) the seemingly endless supply of tacky religious art also reminds me of how easily we dismiss and denigrate the very ones we would love and emulate. Holy kitsch = cautionary tale; or how the free market screws up a good thing (person). Thanks, gentlemen. Thanks to Lent Madness I am now able to identify two more of the saints on the kitsch wooden bracelet with pictures of saints that I purchase (I’m sure from a kid) in Lima, Peru. P.S. I don’t hold up well against kids peddling items in other countries. Listen up, Schenck and Gunn and the guest writers (not in the sky) !!! I don’t know why you are even bothering with these gloomy Gus and Gloomy Gusites in the first place. It takes major intelligence to even appreciate the finer points of kitsch ! Tell them this: “BITE ME !” Oh ! That’s not a Christian attitude. is it? Well, don’t turn the other cheek…they’ll probably bite it, ala Mike Tyson and the missing earlobe. Father, forgive me, I just continue to sin and sin and sin…good lyrics, n’est ce pas? Also as a newbie this year, I just wanted to say thank you for taking the time to educate us, entertain us and challenge us. Isn’t that what our Christian journey is all about? My problem is…what will I do when Lent is over? No daily snappy reparte to look forward to? Now that is a somber point to contemplate. It is true, Holy Week is next week. And, I, for one have enjoyed the silliness. Y’alls first post called this Lent Madness. That is what it has been, and has lived up to it’s promises. I, for one, have not given up humor for Lent. Keep up the great work. The twins are now asking me how we can get the “not so cowardly Jerome lion” for Father Goldacker’s kitsch collection. I think that reveals their vote in today’s match up! Here’s my two cents about some of today’s peevish dust up. While much of LM is tongue and cheek, I think many of us are discovering along the way that a good bit of this exercise is rather meaningful. In our household, Skye and Hope are making lots of connections about their faith. These saintly lessons in religious history and humor are important powerful tools as we pass the torch (sorry Cranmer) to the next generation(s). Thanks so much for this post! I really wanted to yell into cyberspace: “Lighten up, people!” It’s Lent Madness! We’re voting on a saint, for heaven’s sake. I’ve had lots of fun learning about and even from the saintly contenders so far. It’s not the dry, learned style we may be more familiar with, but it’s fun and much more memorable. In addition, it”s not like Lent Madness created and marketed the saintly kitsch, they just put in our faces. It’s already out there! Even the sacred cow of women’s rights and issues can afford to be poked with the funny stick. The laughing Jesus has some very good dental work. I absolutely loved yesterday’s post with all the kitsch, and look forward to the rest! You all have the best senses of humor and are so very creative in this endeavor. I’ve enjoyed Lent Madness so far and learned so much; and have added much reading to an already long must-read list. Thank you for sharing your gifts with us, and challenging us to consider the lives of those who inspire us. There, that’s my gushing fan post. Bonhoeffer toast: Perfect! Of course God laughs. And of course emotion overcomes us as we approach the Holy. It’s all of a piece. There is no love without loss and we can’t really lose what we don’t love. This Humanity stuff is complicated. Laughter is God’s gift to help us cope with it all. Also, I do love the intersection between the sacred and profane that shows in all this kitsch! Please don’t stop. I’m so enjoying every little thing about Lent Madness. It’s madness not to liove the kitchey Elate Eight! As a former Southern Baptist, I say, don’t be so uptight y’all cradle Episcopalians. TBTG for Lent Madness. It’s ordinarily not we cradle Episcopalians who are uptight — we’ve known from birth how to agree to disagree — it’s y’all who came in as adults who can’t tolerate change or diversion or difference of opinion. Bonhoeffer still has my vote. He was a serious man living in a serious time & place. I LOVE all the saintly kitch! Thank you. And yes, every day this week, I’ve gone back and reread the info and quotes for each saint. 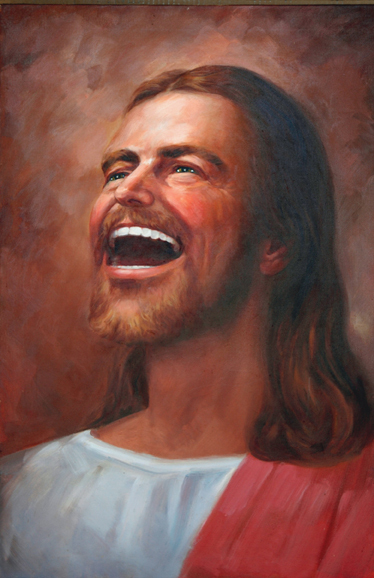 I LOVE the kitsch and I absolutely LOVE the picture of Jesus having a good laugh. Who gave us the gift of laughter and humor? And there is grace in that, you know!! The mugs and mousepads are great and I am sure that Deitrich, Mary, Margaret and the rest would have been the first in line to pick up a few trinkets!! This has been the best Lenten meditation going!! FYI, I am on Team Margaret! I have my own collection of kitsch – and can laugh at my self — just right now with the attack on women in the news and government – kitsch that demeans women is a subject that cranks my crank. Attack your friends is not very funny IMO. A lot of the stuff is just sexist racist crap and it disappoints me that you can’t see that. I guess it just goes to show: Absolute power corrupts absolutely. It’s about time we treated these saints like real people!!! God gave us humor, and glad to see you are using it. Great work! Wow, some of your commenters would really hate the lamp, wouldn’t they, Tim! There is a more than century-old satirical parade in Guatemala City held on the Friday before Holy Week called the “Huelga de Dolores” (roughtly, “the strike of Sorrows,” named after the traditional name of the Friday before Palm Sunday). This parade, organized by university students, was, for many years, one of the only public displays of protest permitted by the government. It often parodies the solemn religious processions that take place during Lent and Holy Week. It expresses sharp critiques of the government, the military, the Church, and other social institutions and goes waaaay beyond kitsch: it can be rough and crude, full of double entendres and straight-up sexual and scatological humor and commentary. So there is a precedent for marking the week before Holy Week with humor and irony!